Although microcredit programmes have long been considered efficient development tools, many forms of debt-induced distress have emerged in their wake. This has brought to light the problem of over-indebtedness, a topic which has been previously underexplored in the literature. This new book, from a group of leading scholars, explores the manifestations, scale, and economic and social implications of household over-indebtedness in areas conventionally considered as financially excluded. The book approaches debt not only as a financial transaction, but also as a form of social bond, and offers a socioeconomic analysis of over-indebtedness. The volume puts forward a broad definition of over-indebtedness, highlighting its situational and semantic complexity and diversity. 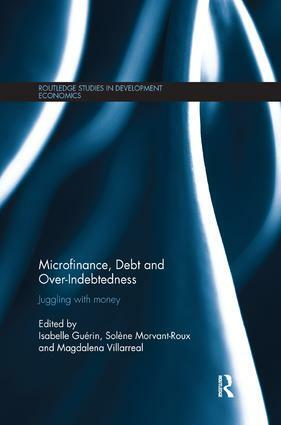 It provides a close analysis of local conceptions of debt and over-indebtedness, highlighting frameworks of calculation and the constant renegotiation of their boundaries. On top of this, it looks far beyond microcredit to examine all the financial practices that individuals juggle. The volume argues that over-indebtedness has more to do with social inequalities than financial illiteracy, and should therefore be understood in the light of global trends of financialization. It also reveals the ambiguity of "financial inclusion" policies, and in many respects questions the actions of new credit providers. This book will be valuable reading for students, researchers and policy makers interested in microfinance and development issues.